This handlset is only available in Canada. These five beautiful sets of Collections door handles offer solid forged brass construction and Grade 1 cylinders for uncompromised security. Weiser lock Door handles truly add style without sacrificing function and security. You're sure to find the door handleset that fits your home with Weiser's wide selection of hardware. 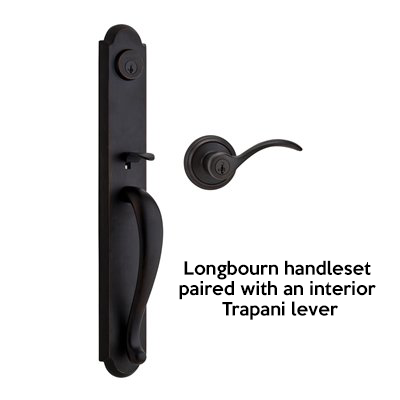 The venetian bronze finish of this Longbourn handleset is hand-rubbed to reveal unique bronze highlights and to provide a rick and warm complement to the product's style. The Longbourn handleset also features Weiser SmartKey® re-key technology. This allows you to re-key the lock yourself in seconds (depending on the function). SmartKey cylinders feature a stainless steel side locking bar, racks, and pins for increased strength and security. The side locking bar offers improved security by protecting against lock bumping, an attack technique used to defeat convention pin and tumbler locks. 9471: Handleset with Interior Pack Single Cylinder Deadbolt - Latch bolt operated by thumb piece outside and knob/lever inside. Deadbolt operated by key outside and thumb turn inside.